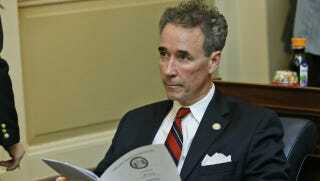 Once upon a time not all that long ago, former Virginia delegate Joe Morrissey served six months in jail for contributing to the delinquency of a minor. He was accused of having an affair with and impregnating his teenage secretary, charges he’s always unconvincingly denied. And then yesterday, he handed a reporter a lovely staged photo of himself, the secretary, and the baby. Morrissey was accused of having an affair with Myrna Pride, a secretary at his law office, when she was 17. He entered an Alford plea on the delinquency charges in December 2014, an admission that the state had enough evidence to find him guilty but without his actually admitting guilt. Pride had her baby in March. Morrissey was reportedly present for the birth. St. George and fellow reporter Scott Wise say they asked Morrissey if the photo was an admission that he fathered the baby. Morrissey said “No,” and walked away. That’s the weirdest “no” I ever heard. Morrissey has vacated his delegate’s seat to run for State Senate. He and Pride both face new criminal charges of felony forgery as well as perjury; they are accused of falsifying a child support document meant to act as an alibi during Morrissey’s first trial.